Ronnie O'Sullivan makes a "flawless" 131 break on his way to a 10-7 lead in the World Championship final against Mark Selby. It was the 747th century of O'Sullivan's career, as he closes in on Stephen Hendry's career record of 775. 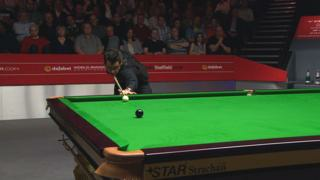 Play resumes on Monday at 14:00 BST with five-time champion O'Sullivan needing eight frames for a third consecutive title at the Crucible.